Elie Tahari is global luxury lifestyle brand headquartered in New York City. The ready-to-wear style of clothing has captured the attention of the fashion world and international recognition. Apart from apparel, it also sells accessories, shoes, and other items. With Big Apple Buddy’s personal shopping service, you can now buy direct from the Elie Tahari online store anytime, anywhere. Start getting ready for the cold seasons with the Elie Tahari Tabitha Shearling Coat. This elegant and warm choice for the winter time is one of the most exclusive of the collection. The soft fur is one of the finest in the world and makes this coat so one of a kind and a must-have overcoat. The timeless look of the fur coat and the two color options go with whatever you wear underneath. The Emily Suede Dress in Horizon of the Elie Tahari collection is the dress you've been waiting for! A classic style with a modern look, this dress is one of the most popular of the season. It's perfect for any occasion as it is elegant but subtle and comfortable to wear. The high quality material is soft to the touch and fits to your form. Combine it with the Tabitha Shearling Coat for an amazing look. 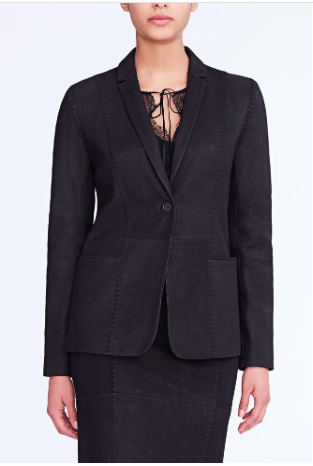 Nothing says "boss" like the Elie Tahari Dorinda Jacket. This is the ideal jacket for a business event where you'd like to ooze confidence. The two front pockets are convenient when you have to have essentials items close to you meanwhile the one-button closure allows you to show off the rest of your outfit. You can combine it with a blouse or nice shirt to make for the perfect office look. Unfortunately, the USA Elie Tahari online store does not currently offer international shipping. However, Big Apple Buddy, your personal shopper, can help you buy products direct from the official USA Elie Tahari online store and ship them to your doorstep, no matter where you are in the world. We offer international shipping to over 190 countries including Australia, Austria, Bahrain, Belgium, Bosnia & Herzegovnia, Brazil, Brunei, Canada, China, Croatia, Cyprus, Denmark, Estonia, Finland, France, Germany, Hong Kong, Hungary, India, Indonesia, Ireland, Israel, Italy, Japan, Kenya, Kuwait, Lithuania, Macau, Malaysia, Maldives, Mexico, Namibia, Netherlands, New Zealand, Norway, Oman, Pakistan, Portugal, Saudi Arabia, Scotland, Serbia, Singapore, Slovenia, South Africa, South Korea, Spain, Sri Lanka, Sweden, Switzerland, Taiwan, Tanzania, Thailand, UAE, UK and Ukraine. If you would like to buy from the USA Elie Tahari online store, simply let us know which items you would like to order (by filling out the form on the right) and we’ll get back to you with a free international shipping quote within 24 hours!